There are a few developers in the slots industry where you must stand up and take notice whenever they launch a new slots title onto the market. The prestigious Bally Technologies are one of those developers so when they put a branded slot on the market then you really know it's time to shut up and listen. 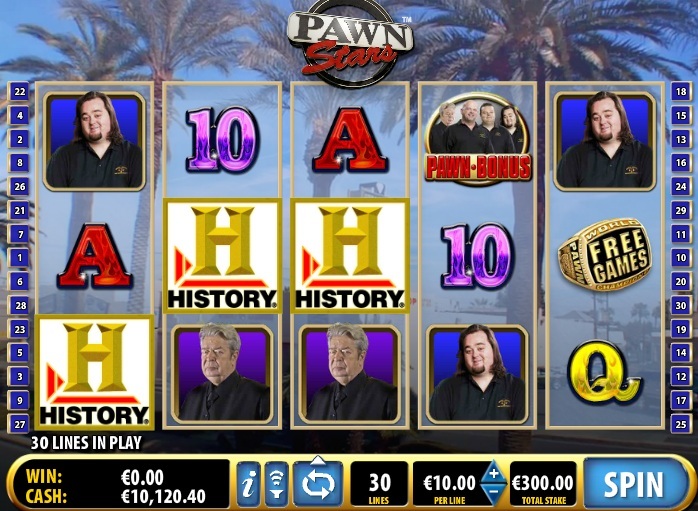 Pawn Stars is a 5 reel, 30 payline slot based on the popular hit television series of the same name that is filmed in Las Vegas, coincidentally home to Bally, and follows the daily events at the World Famous Gold and Silver Pawn Shop in the city. It has long been the number one show on the History Channel lasting for 9 seasons over 370 episodes. Fans of the show will not be disappointed with the slot's authenticity as seemingly no detail has been left uncovered. The symbols on the reels include all the four main characters from the show including Rick Harrison, Richard “Old Man” Harris, Corey Harrison, and Austin “Chumlee” Russell. The History Channel logo also appears on the reels delivering a payout of 5,000 coins if you hit five of them across the reels. The regular 10-through-to-Ace symbols fill in the remaining positions on the reels. The Pawn Stars logo acts as the Stacked Wild on this slot. It substitutes for all symbols on the reels, except for the two Scatters, to complete any potential winning combinations that might appear on any single spin. However, Stacked Wilds only appear on reels 2, 3, and 4. Any wins involving the Stacked Wilds will also pay double. There are two Scatters on this slot with both of them delivering joy for you if you can hit them across the reels. The first is the Pawn Stars Bonus symbols that appear on reels 2, 3, and 4. If you hit three of these symbols across the reels then you will launch the Pawn Stars Bonus. This is a Pick'em Bonus where players must select items and are offered a reward up to 3,000x their bet that they can accept or refuse. This carries the risk of the second offer being lower than the first so it has a gamble element to it within the bonus feature as opposed to after the bonus feature which makes a change. The second set of Scatters are the Free Games Bonus symbols. If you hit three of these symbols on reels 1, 3, and 5 then you will earn some free spins. You are initially awarded 10 free spins with a 2x multiplier attached to any wins achieved during the Free Games Bonus. It is not possible to re-trigger the Free Games Bonus symbols because the Scatters do not appear on the reels during the free spins. 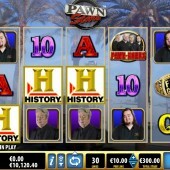 Pawn Stars is a slot that a number of fans of the show were craving to see on the market leaving other reality television fanatics of shows like Ice Road Truckers and Dog the Bounty Hunter very jealous. The fact that is has been developed by the masters at Bally is a huge bonus and it is the first big name brand slot that the developer has added to its online portfolio so it brings with it an extra ounce of attention. If you loved other Bally slots such as the snowy Wild Huskies and the Greek mythology-themed Cupid and Psyche that carry that familiar Bally feel then you will not be disappointed in this slot. After the success of NextGen Gaming's An Evening with Holly Madison slot it appears that slots and reality television are fast becoming a match made in heaven.